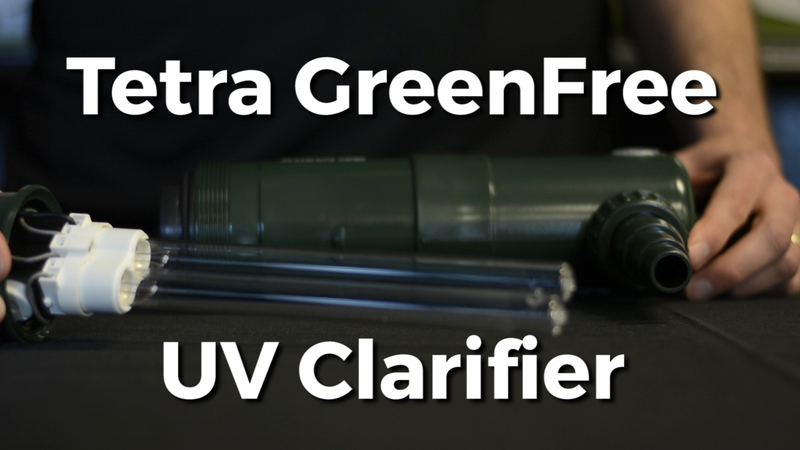 Tetra GreenFree UV Clarifier Review The Tetra GreenFree UV clarifier is an external, in-line unit ideal for new or existing, small to medium sized ponds. Designed to eliminate that unsightly green or pea soup colored water. Water is pushed through the clarifier via a pump and the internal high intensity UV light destroys the microscopic algae cells that form green water. It’s important to note these units will not affect string algae, and they are ONLY designed as an enhancement to your existing filtration. Stepped barb swivel fittings on both ports for easy removal and maintenance. These fittings will accept 3 different tubing sizes- ¾”, 1”, and 1-1/4”. If necessary, take a hacksaw and remove sections not in use. A viewing window. This will allow you to easily see when the unit is operating. Keep in mind this is not an LED light. It can be difficult to see during the day and is best viewed at night. To disassemble, simply remove the threaded collar here. Inside you’ll find a glass quartz sleeve, which keeps everything watertight, and of course the UV bulb. You’ll want to periodically remove the sleeve to clean. You can do that with a small flat head screwdriver. The bulb itself will generally need to be replaced every 12 months of run time. These units should be brought inside during freezing conditions. Available in 4 models- each unit is rated to handle a specific size pond and pump so, if you need assistance sizing the unit that’s right for your system, don’t hesitate to call. I’m Joe from webbsonline, take care.